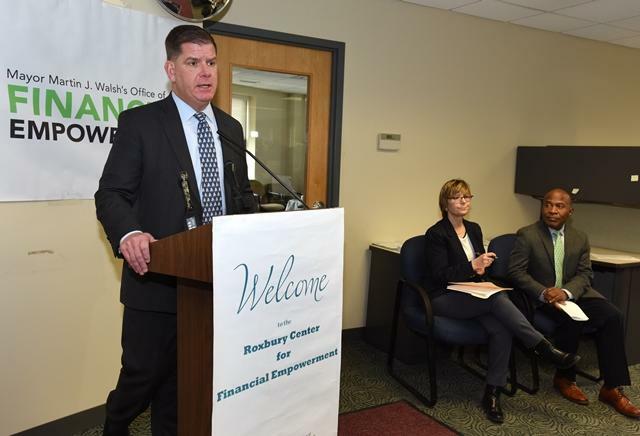 BOSTON - Tuesday, January 29, 2019 - Mayor Martin J. Walsh today joined the Boston Tax Help Coalition and other community partners at the Roxbury Center for Financial Empowerment to highlight free tax preparation services available to low- and moderate-income Boston residents. The Coalition provides free tax preparation services at more than 30 partner locations throughout the City to help residents who earn $55,000 or less per year maximize the Earned Income Tax Credit and claim the full refunds they are due. "The free, IRS-certified tax services offered by the Boston Tax Help Coalition are an opportunity for hard-working Boston residents to save money," said Mayor Walsh. "I thank our dedicated volunteers who make these efforts possible, and encourage the thousands of residents who are eligible for these services to take advantage of them." The Coalition serves approximately 13,000 taxpayers per year and last year enlisted hundreds of volunteers to return $24 million in refunds and credits directly to taxpayers. "As a business owner, I have saved a lot of money on having my taxes prepared at the Roxbury Center for Financial Empowerment," said Cynthia Jones, founder and CEO of The Women's Group of New England. "I am now moving forward and growing my business. I am so thankful for the staff at the Center. They were there when I needed them." In addition to tax preparation, the Coalition provides clients with other services to improve their financial health. For example, the Coalition connects taxpayers to Bank On Boston, an initiative launched by Mayor Walsh that helps residents identify banking services that are safe, affordable, and non-predatory. Trained financial guides also offer taxpayers the Financial Check-Up, a key component of Boston Builds Credit, the City's free credit building program. A Financial Check-Up is a one-on-one session in which a taxpayer can review his or her credit score and obtain personalized credit-building strategies. The Boston Tax Coalition offers Financial Check-Ups at 15 tax sites, up from 12 last year. New this year, the Coalition will also be using the Financial Check-Up as an outreach tool to identify taxpayers who aspire to homeownership. These taxpayers will be eligible for Homebuyer Readiness workshops and individualized financial coaching and credit building assistance to help them work toward that goal. These services will be available at the Roxbury Center for Financial Empowerment, with additional workshops offered through community partners across the city. These homeownership services are made possible by a $175,000 grant from the Wells Fargo Foundation as part of the organization's NeighborhoodLIFT program, a $6.75 million commitment to boost sustainable homeownership and revitalize neighborhoods. "Wells Fargo is passionate about helping individuals, families and communities achieve their goals," said Jennifer Crampton of Wells Fargo's Community Lending and Investment division. "These local initiative grants will help most Boston area residents who want to become homeowners - a goal that aligns perfectly with the NeighborhoodLIFT program. We are excited to work together to make lasting changes for the better." "The beginning of the tax season is our favorite time of year," said Alan Gentle, manager of the Roxbury Center for Financial Empowerment. "We see many residents who have been getting their taxes done with us for years. Plus, we're able to connect taxpayers with other services offered by our bilingual staff - from financial coaching to small business assistance to, now, homebuyer assistance." The Boston Tax Help Coalition is part of the Mayor's Office of Financial Empowerment.